Flexible. Lenovo tries to make using a touchscreen easier for the users of the IdeaPad Flex 15D with an opening angle of up to 300 degrees. We indeed liked this solution. Our test uncovers whether the device is also convincing beyond this feature. 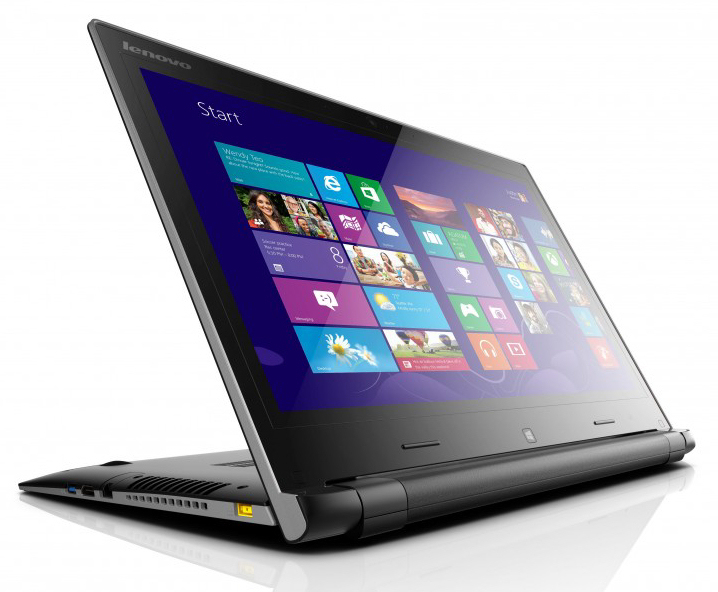 With the IdeaPad Flex 15D, Lenovo offers another notebook with a display that can rotate up to 300 degrees. With the Lenovo IdeaPad Flex 15 59394106 (Pentium 3556U, HD Graphics (Haswell)), we already reviewed a representative of this series. Unlike the Flex 15, Flex 15D models feature AMD APUs. Our test model comes with an A6-5200 APU. We compared it to the following competitors: Toshiba Satellite C50-A-1JU (Pentium N3520, HD Graphics (Bay Trail)), and Acer Aspire E1-572 (Core i3-4010U, HD Graphics 4400). As we have already reviewed the Flex 15D with other components, we will not cover case, display, connectivity, input devices, and speakers here. This information is available in our review of the Flex 15. The Lenovo Flex 15 is available in two colors: orange-black and gray-black. Our IdeaPad Flex 15 59394106 test model came with the first color, the Flex 15D with the second one. 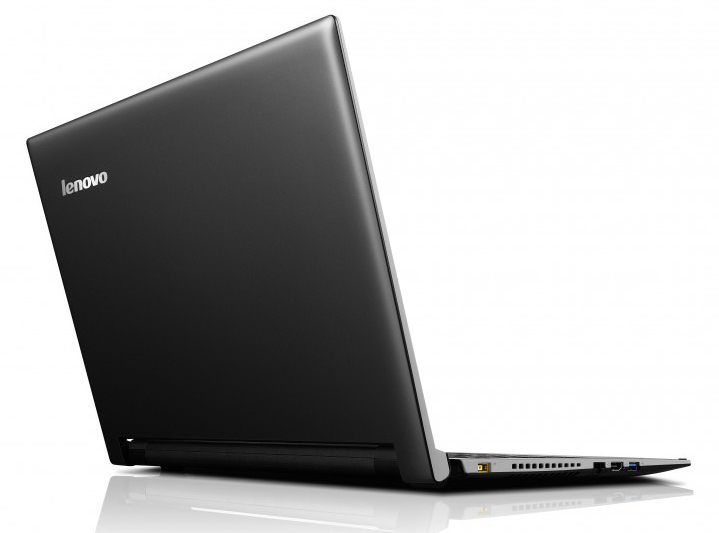 The Flex 15 in notebook mode (picture: Lenovo). The lid is rubberized (picture: Lenovo). The Flex 15D comes with the same display as the Flex 15. They are not especially bright, but they feature a good contrast. 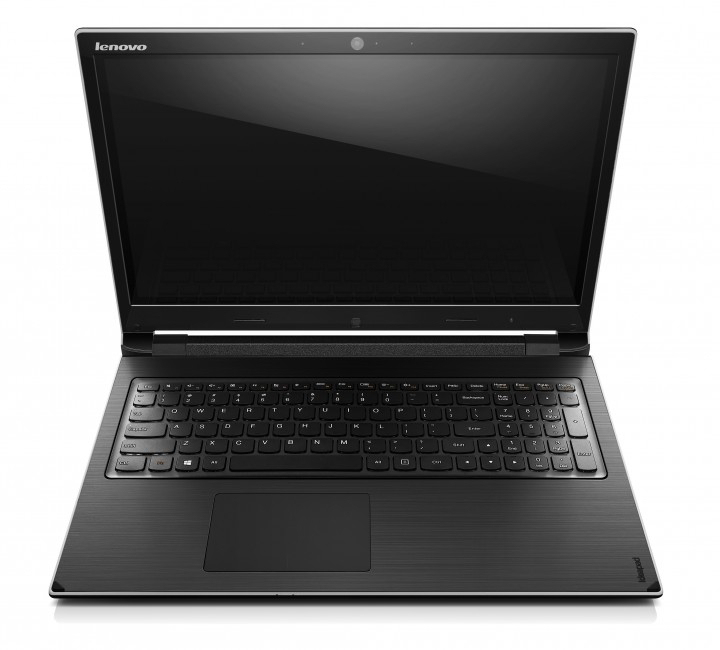 With the IdeaPad Flex 15D, Lenovo offers a simple 15.6-inch office notebook. The CPU performance of its APU is sufficient for everyday usage scenarios like surfing, Skype, writing etc. Those requiring more CPU performance can select one of the numerous other models of the Flex 15 series. Lenovo equipped these with Intel or AMD processors. The models differ in CPU, RAM capacity and hard drive type and capacity. In addition, there are models with the GeForce GT 720M GPU. Our test model is available for about 480 Euros (~$663). Currently, the cheapest model with a dedicated GPU is Lenovo's Flex 15 59394031 with Pentium 3556U processor and GeForce GT 720M graphics priced at about 550 Euros (~$759). With the A6-5200M APU, a representative of the Kabini generation from AMD works inside the Flex 15D. The CPU part of the APU is a quad-core processor with a clock rate of 2 GHz without Turbo. The TDP of the APU is 25 Watts. Therefore, it comes in between standard mobile APUs (about 35 Watts) and ULV APUs (about 15 Watts). 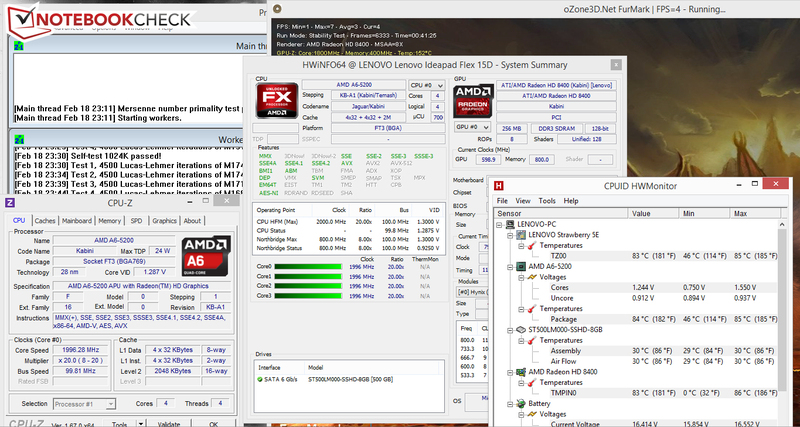 During the CPU test of the Cinebench benchmarks the processor permanently clocks at 2 GHz. The results of the three devices in our comparison are rather close to each other in the multithread test. In the single thread test, the Aspire is the clear leader since it features the fastest CPU overall. In general, the system runs smoothly. 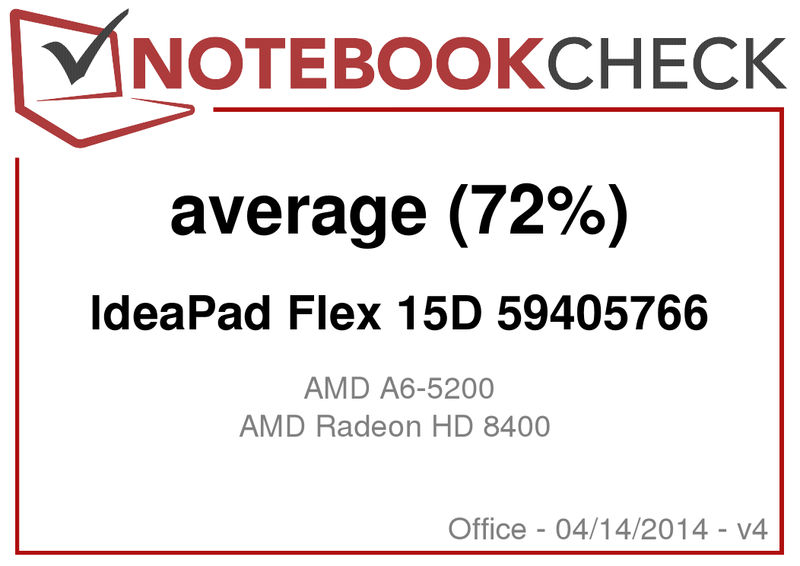 The Flex 15D achieves a good result in the PC-Mark-7 benchmark, which is unusually high for a notebook with AMD APU. The reason is found quickly: The Flex 15D profits a lot from its hybrid hard drive. The Aspire (Core i3-4010U, HD Graphics 4400) is on par, but the Satellite (Pentium N3520, HD Graphics (Bay Trail)) performs worse here. The Flex 15D is equipped with a hybrid hard drive from Seagate with a capacity of 500 GB and a revolution speed of 5400 rpm. The hard drive is supported by an integrated SSD cache (8 GB). CrystalDiskMark reports a read rate of 92.7 MB/s. This value is okay for a 5400-rpm drive. The graphics core of the Flex 15D is called Radeon HD 8400. It supports DirectX 11.1 and works with a clock rate between 267 and 600 MHz. In the 3D Mark benchmarks, the Flex 15D comes in between the Satellite (Pentium N3520, HD Graphics (Bay Trail)) and the Aspire (Core i3-4010U, HD Graphics 4400). The Radeon core's performance is about on par with the HD Graphics 4200's. The Flex 15D has not been designed for 3D computer games. It can smoothly run a few games in low resolution and low graphics quality at best. If a game is not too demanding, it will also run smoothly in native resolution and with high quality settings. For example, FIFA 14 is such a game. Games made for the Metro interface of Windows 8/8.1 usually work without problems. The Satellite and the Aspire are not different here since they only feature weak graphics cores, too. While idle, only the permanently running, yet not particularly disturbing fan is audible. The Flex 15D only gets loud under full load. In addition, the fan whistles in a disturbing way in this scenario. The Aspire and the Satellite are quieter than the Flex 15D in all scenarios. For the most part the Satellite works silently since it does not have a fan. Therefore, only its hard drive is audible. The Ideapad Flex 15D during the stress test. None of the three devices in our comparison suffers from heat problems. The temperatures are in the green at all measurement points while idle and under load. In mains operation and on battery, the CPU of the Flex 15D permanently clocks at 2 GHz during the stress test (Prime95 and FurMark run for at least one hour). The GPU runs at full speed (600 MHz) in mains operation, but its clock rate is decreased to 400 MHz on battery. The CPU temperature hovers at about 85 degrees Celsius (185 Fahrenheit) during the stress test (mains operation). (+) The maximum temperature on the upper side is 39.6 °C / 103 F, compared to the average of 33.9 °C / 93 F, ranging from 21.2 to 62.5 °C for the class Office. The three computers are rather frugal while idle. The Flex 15D's power consumption of 4.8 to 7.2 Watts is lowest. Under load, the Lenovo notebook needs the most energy. This is not surprising since the Satellite and the Aspire feature CPUs that are more frugal. TDPs of their CPUs are 15 Watts (Core i3-4010U) and 7.5 Watt (Pentium N3520). Our realistic WLAN test automatically loads web sites in 40-second intervals. The energy-saving profile is selected and the display brightness is set to about 150 cd/m². This test ends after 3:46 h on the Flex 15D. The Satellite (5:51 h) lasts significantly longer. On the Aspire, we ran this test via LAN since its Wi-Fi module was defective. It achieved a battery life of 3:55 h.
It is not surprising that the Flex 15D has the shortest battery life. It also features the battery with the lowest capacity (Lenovo: 32 Wh, Acer: 37 Wh, Toshiba: 48 Wh) among all three devices in our comparison. 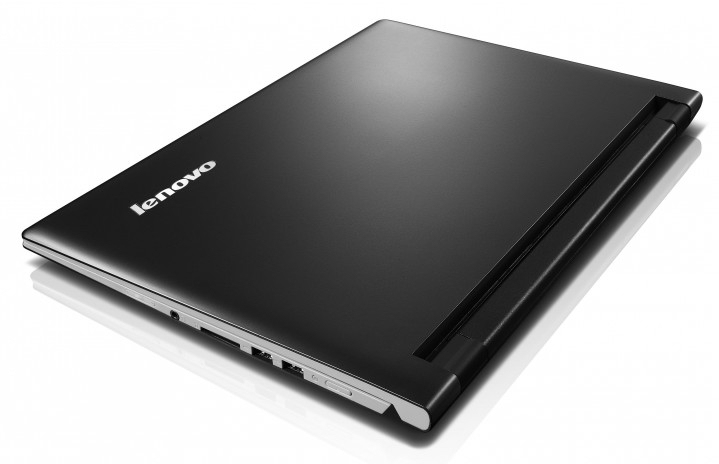 The Lenovo Ideapad Flex 15D. The Lenovo IdeaPad Flex 15D is suitable for users looking for a notebook for simple tasks like surfing, writing, Skype, watching videos etc. The performance of the APU is sufficient for these tasks. The computer usually works quietly and hardly gets warm. Fans of touchscreens will appreciate the stand mode, which makes using it easier. The cons of this computer include the display. While it has a good contrast, it is dark and bluish. The Acer Aspire E1-572 can be considered if a computer with matte, full HD display is desired. In addition, the Aspire features the fastest CPU among the three devices in our comparison. 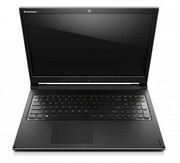 The Toshiba Satellite C50-A-1JU scores points with long battery life and very low system noise. Lenovo dropped the VGA-out and equips almost all consumer notebooks with just Fast-Ethernet.